LiveCode allows you to expand its capabilities with custom plugins. This lesson explains how to set up and install user plugins, such as the revMobile plugin. By default, LiveCode expects user plugins to be in a particular location. The location is flexible though, and if you are a previous Rev user with an existing plugins folder, you can use that one instead. Or you may want to choose a different location if you don't want to use the default for some reason. New LiveCode users should generally follow the first part of this lesson to create a default Plugins folder. If you prefer to share your plugins with older versions of Rev, or if you want to create a custom location, skip down to the last section of this lesson titled "Setting up a custom location or sharing an older plugins folder". Create a folder called "My LiveCode" at the correct location for your OS (Linux users should name it "my_livecode" instead.) Inside that folder, create a second folder named "Plugins". Copy or move your user plugins into the new Plugins folder. In this example we have moved "revMobilePlugin.rev" there. The next time you restart LiveCode, your plugins will appear in the Development/Plugins menu along with the default IDE plugins. If you have a previous version of Rev that already uses a plugins folder, you can share it with LiveCode so that both programs use the same plugin files. This is also how you choose a custom location if you want your plugins stored somewhere besides the default location. If you don't already have an earlier Rev folder, create a new folder at any convenient location named whatever you like (for example, "LiveCode Extensions") and inside that, create another folder named "Plugins". Place your plugin .rev files inside. LiveCode requires the enclosing folder because that's also where future externals, resources, and other supplementary files will go. 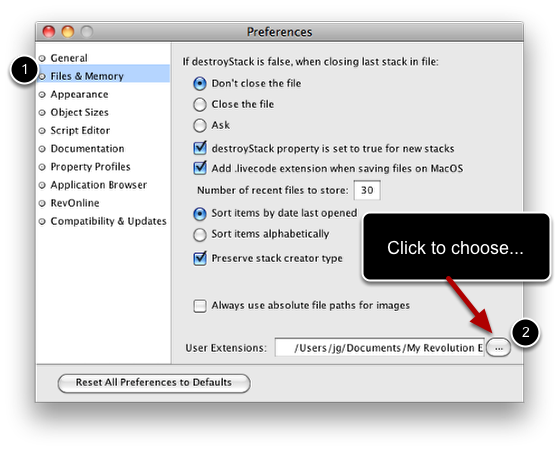 Launch LiveCode, open Preferences and choose "Files & Memory" from the list on the left. At the bottom of the pane you will see "User Extensions:" Click the "..." button and choose the folder that holds the Plugins folder. In our example, that would be the "LiveCode Extensions" folder. In the image above, we have chosen an existing "My Revolution Enterprise" folder from Rev 4.0, because it holds the Plugins folder we want to share. Make sure you select the folder one level above the Plugins folder. If you choose the Plugins folder itself, they will not load. Restart LiveCode and your plugins will appear in the Development menu. You can also use your operating system's Search utility to locate the "livecode.rev" file. After deleting "livecode.rev", restart LiveCode, set its Extensions path to the folder that contains the Plugins folder, and restart LiveCode once more. Next: How Do I Upload an Extension to the Extension Store?